Each round, twelve nobles are lined up for the guillotine. The nobles are worth varying points, depending on their notoriety. During your turn, you play action cards to change the order of the line so you can collect the best nobles. The player with the most points at the end of the game wins! Another instant hit for new gamers whenever this is put up on the game table. Though it is wordy on some of the action cards, especially for new gamers, they will pick it up soon after a first game and yell for "Another Game !!". Certainly fun and you need some luck to win the game. 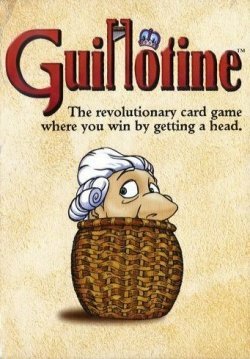 Guillotine is one of my family's favorite games. Each round you play actions cards to change the order of the line up to the guillotine. This enables you to collect the best nobles(with the highest points) that enable you to win the game. You can bribe the guards, but sometimes you can behead the wrong person and lose points. It is a fun and humourous game. One of my favorite short games. I love the mechanics and artwork. The concept may not seem suitable for children, but the 'beheading' aspect isn't portrayed in a realistic way, and its historical significance takes the edge off the violence. It should be said, however, that there isn't a ton of strategy in this game. With the cards you're given, there's usually only one 'best' action. Still, it's great fun to pick up and play, and takes about one minute to learn. Can't go wrong with that! Great game. Simple and easy to learn and most of all, no bloodshed is even portrayed in this seemingly gruesome game. Everyone in the line to the chopping block has a value point. You get the one in front of the line during your turn. You get to draw a card, play one (if you want) and then collect. When all the people are gone, that's the end of the day. After 3 days, whoever has the highest point total wins. Love this game! An incredibly fun end-of-the night last-call type of game. The theme and artwork are funny (killing French nobles!) but it has decent strategy too. An inexpensive game that already has earned its price for me. Enjoy! This is a wacky, zany, but fun game. I love the theme and the fact that there are only a few duplicate action cards in the deck. Each play is different. It works well with two players but the tension just grows with more. Will the head you want still be in line by the time it is your turn again, or will your best laid plans be ruined? Fun game!